Power is a quality of the Universal Being; just like Love, Truth and Life. If we are to grow and evolve as spiritual beings, we need to become comfortable with our innate Power. As God is Power, we too have Power. It’s not something we need to create, find or take from others. It’s something within us we can focus to create the life we want. 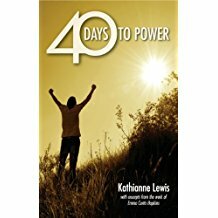 Through a daily email including a lesson, affirmation, and audio commentary by Kathianne Lewis, DD, and using her book, 40 Days to Power, Kathianne will elaborate on the lesson material and suggest ways to make them even more personal and practical, helping up to rise up in Power. Share with your friends and family, near and far; everyone can be part of 40 Days to Power! Tuition: $49 Your price of $49 includes the 40 Days of audio and the daily emails with journalling prompts.